Kuala Lumpur. I’m not sure why I’m head over heels in love with this place. This is one of those cities I can consider myself living in for a long period of time. Considering that I’m not big on migrating to other countries, that’s something. Maybe it’s because this was in fact the first place I’ve visited outside the Philippines. Perhaps it’s because people are warm and friendly, even if the only phrases I could say are Terima Kasih and Selamat Pagi. Probably it’s because I can blend in the crowd thanks to my skin color and facial features. I don’t really know, but just the same, I love KL. It’s my third time to visit the city — the first being in 2008 for my Malaysia-Singapore trip and the second in 2009 as part of the bigger Southeast Asia trip — though this one’s going to be a very short stopover on my way to Jakarta. Initially, the plan was to travel to India via KL, maybe stay in KL for a few days before dipping into the Indian sub-continent. But due to unforeseen circumstances, the flight to New Delhi was cancelled, leaving us with Indonesia as the main destination. We could have easily flown from Manila to Jakarta, but since we’ve already booked a one-way ticket to KL, we’ve decided to just use it since it would save us money for the airfare as against booking the direct flight. We really did not intend to leave the airport at first; however, as our inbound flight was moved earlier and our outbound flight was scheduled later, we had 8 hours to fill — enough time for us to travel from the airport to the city center and back. We initially debated whether we’d take the taxi to the center or not: we were six in the group, hence we needed to take two taxis for RM 75 each or take a mini-van taxi for RM 200, or just take the KLIA Transit for just RM 12.50 each. It was so much cheaper to take the train, but our problem was that we might wait for a long time for the train to arrive. We therefore just took the mini-van taxi, forgetting that this will hurt our budget somehow. We were greeted by a light shower on the way to the city proper, but before reaching the Twin Towers, a full-blasted downpour of rain was upon us. It was a different experience to see a gloomy and wet KL, where everything was drab and gray and sad. My heart was sinking. Let this not be the case in the days to follow, I prayed. Taking the taxi paid off: we got into Aquaria KLCC without getting wet. This is the only destination we’ve scheduled to visit for the day. 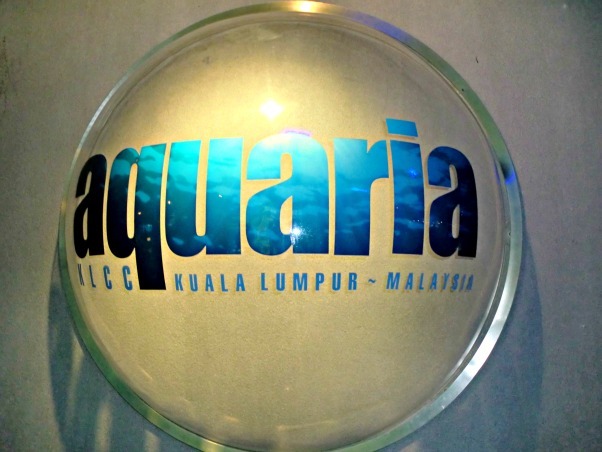 Aquaria KLCC is a oceanarium locted near the Petronas Twin Towers. Though I’ve been to the bigger Sentosa Underwater World in Singapore (shame on me for not yet going to Manila Ocean Park), the experience in Aquaria was totally different because we had a lot of time to see the place and the oceanarium was not as packed with people compared to that of Singapore. Here, I got my first time to see tortoises swimming and the first time to point out where the stone fish is. Thanks to the limited number of people around, I also had the chance to enjoy their wonderful tunnel which featured huge sharks and the ever-beautiful sting rays. A water rat – yikes!